Post: Gaurav Akrani. Date: 9/30/2010. Comments (2). Label: Banking. Opening / modifying / closing accounts on the system including scanning of signatures duly authorised by competent official. Add / modify / delete records in masters and parameter files jointly with higher authority. Issue / delete cheque books on the system. Accept and post Stop Payment instructions. Accept, modify and delete standing instructions as per customers' instructions. To key in particulars of the vouchers / documents correctly and authenticate the same in token thereof. To compare particulars of the keyed in data with the visual display unit and/or from the printout and ensure that the data is entered correctly into the computer and effect such corrections as may be necessary according to the operational procedures of the system. To maintain / authenticate register/s as notified by the bank from time to time for documenting physical security, access control, breakdowns, corrections etc., on a day to day basis to ensure safety and security of computerised operations and normal functioning of the system. To generate various reports / statements and take backup of data as specified. To perform all the day end / month end quarter end / half year-end activities as provided by the system including calculation of interest, balancing of books. Post all vouchers / cheques. Attend to queries, generate statements and print / write passbooks, deposit receipts, POs, DDs, etc. Generate and print interest and service charges application reports. Print registers / supplementaries / scrolls / vouchers and balances with totals and balance them. Exercise the powers of teller whenever necessary. Perform the duties of paying and receiving cashier. Such other work as ledger keeper and/or counter clerks of various departments have been performing or are required to perform as per bank's usuallexisting practices. Any other duties from time to time depending on the requirements of the management. 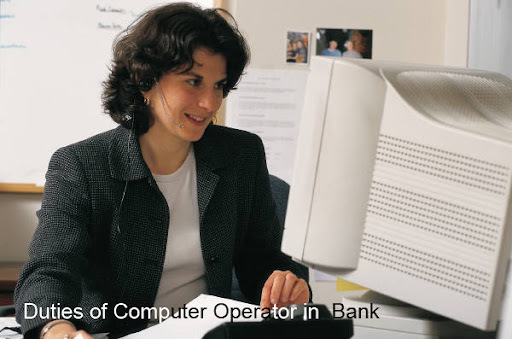 Great list explaining the minute details of work every computer operator working in a bank must do. Thanks for sharing this list.